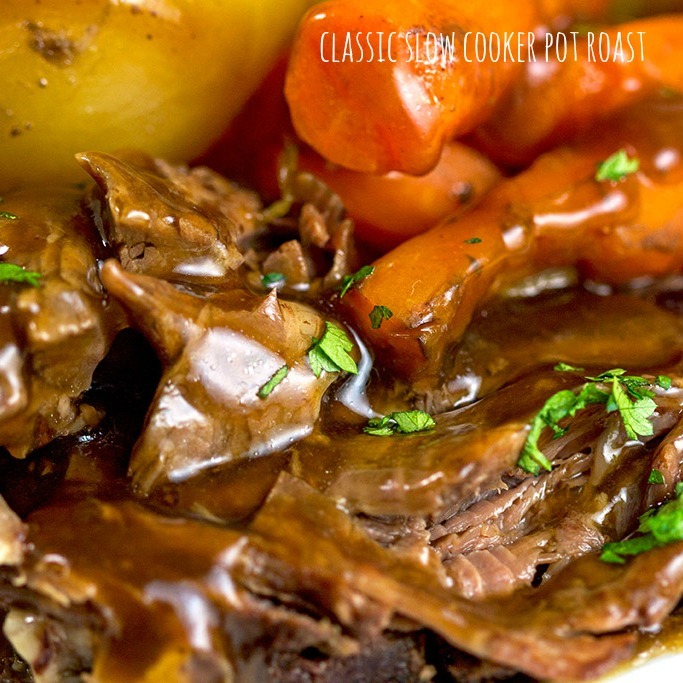 A classic American dinner–pot roast. 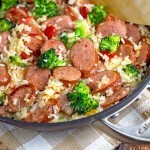 The all-time comfort food made easily in the crock pot. Pot roast always makes me think of a Norman Rockwell painting. 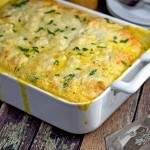 After all, it’s an American classic for Sunday dinner. The slow cooker makes it easy because it does all the work for you. This is one you can truly set and forget. 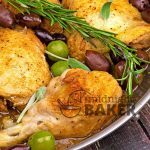 I’ve always found that the flavor improves if it sits overnight, so I make mine ahead then chill the pan juices separately from the meat and veggies. That way, it’s pretty easy to skim off the fat because it will all congeal! Then I just reheat everything in the pan juices and thicken the gravy. Chuck really makes the best tasting pot roast, but it does contain it’s fair share of fat–which is why it’s tasty–so whenever I use it, I do chill the juices. Rump would be a good, less fatty alternative to the chuck. I’ve substituted it when it’s been on sale and was very pleased with the flavor. Since it’s shaped like a roast, you can then get real slices instead of “hunks” of meat. Spray or line the crock of a 5-7 quart slow cooker. Sprinkle rub on all sides of the meat and rub in well. Place meat and onions in slow cooker. Peel carrots and slice in half crosswise. Cut celery in 1-inch chunks. Peel potatoes. Place them all in the slow cooker. Add the water and the stock cubes. 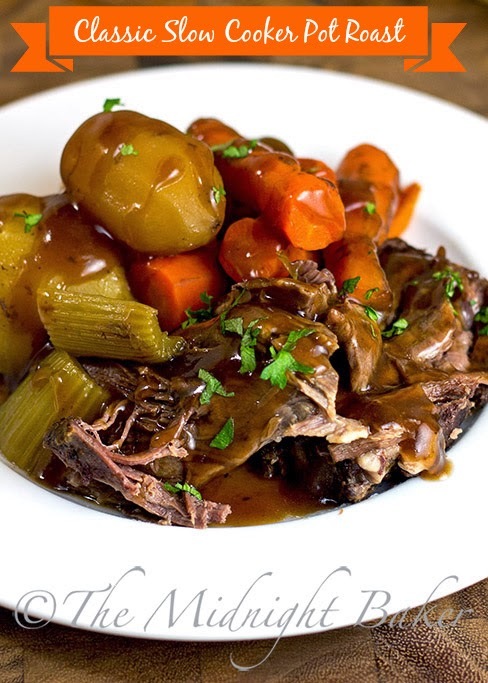 Cover slow cooker and cook on HI for 5-6 hours or on LOW for 8-10 hours (times approximate). 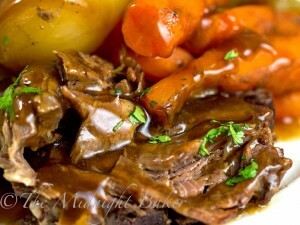 HINT: I always make my pot roast a day in advance so I can chill the liquid and remove the congealed fat easily. 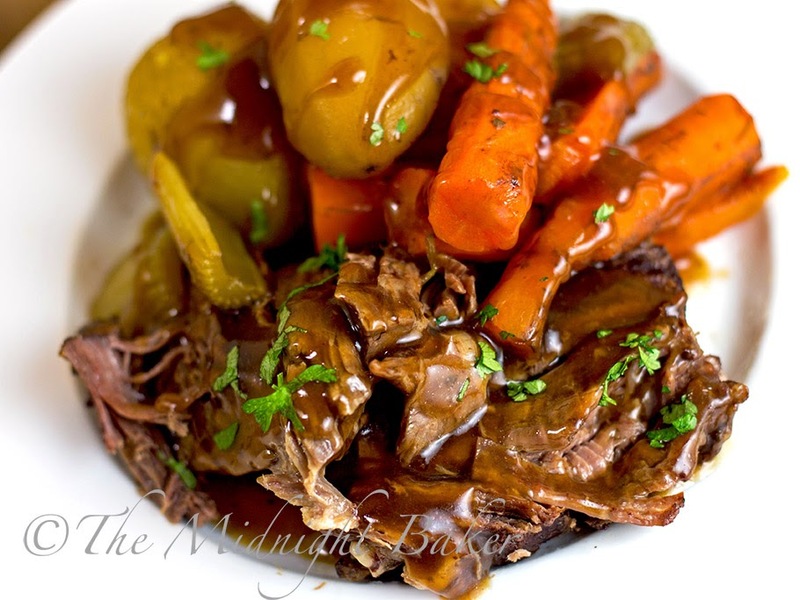 Plus pot roast improves when it sits overnight! Try this if you don't do it already! When roast is done, remove meat and vegetables. Either skim the fat from the liquid (or use my method of chilling to let the fat congeal for easier removal). Add the Gravy Master at this point if you are using it. To thicken pan juices, turn slow cooker to HI and stir in 2 tbs cornstarch mixed with 2 tbs water for EACH cup of pan juices. Stir constantly until well mixed. Cook for 1 minute after juices begin to bubble. If you cook it the day before as I do, store the meat & vegetables in a separate container from the pan juices. 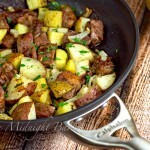 Skim the fat off the chilled pan juices and reheat the veggies and meat in a pan on the stove. When heated through, remove the meat & veggies and proceed with thickening the gravy, if desired, as above.